The next issue of the Carnival of Mathematics, rounding up blog posts from the month of March, is now online at Math Off The Grid. The next issue of the Carnival of Mathematics, rounding up blog posts from the month of December, is now online at Ganit Charcha. The next issue of the Carnival of Mathematics, rounding up blog posts from the month of November, and compiled by Ioana, is now online at Life Through a Mathematician’s Eyes. Issue 161 of the Carnival of Mathematics, slightly belatedly rounding up blog posts from the month of August, and compiled by Alex, is now online at CoDiMa. 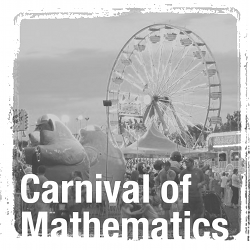 The next issue of the Carnival of Mathematics, rounding up blog posts from the month of October, and compiled by Elias, is now online at The Math Section.